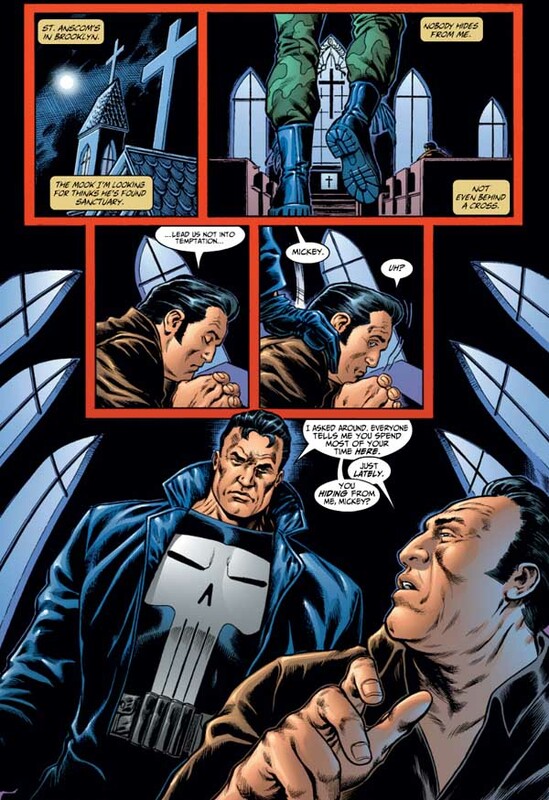 BELOW: The Punisher finds his long-time informant Mickey Fondozzi praying in St. Anscom's Catholic Church, a place the man has lately been spending considerable time at. 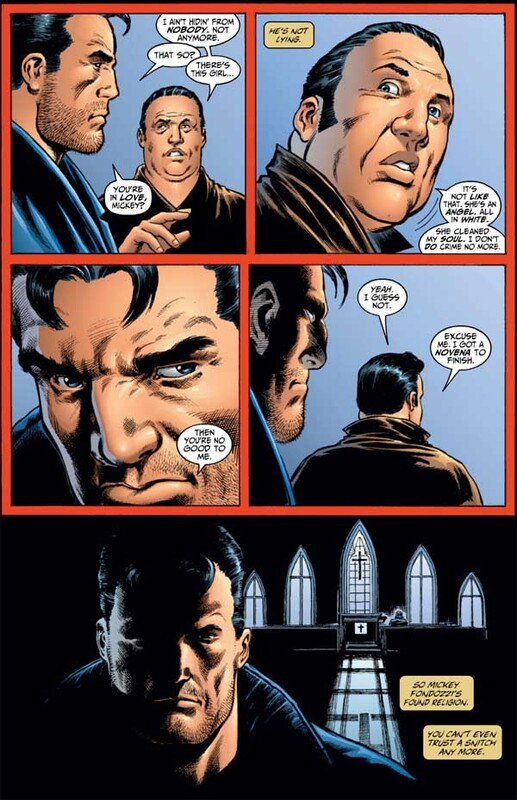 The Punisher initially believes that former criminal Mickey Fondozzi has come to the church seeking sanctuary, a place to be safe from the Punisher himself. The Punisher is mistaken. Fondozzi is there to pray. Note Mickey Fondozzi's words: "...lead us not into temptation..." He is reciting the Lord's Prayer. 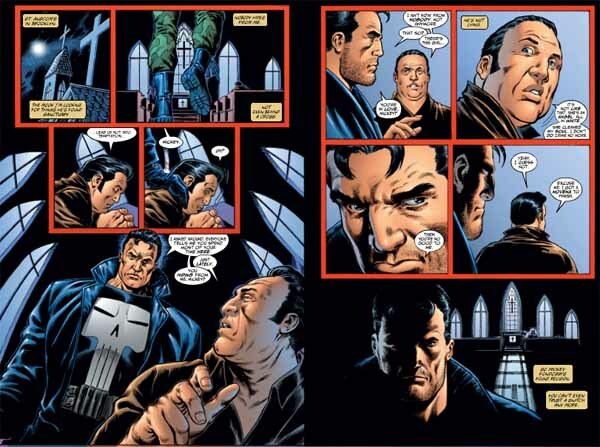 BELOW: Since experiencing Dagger's soul-cleansing light daggers, the Punisher's informant Mickey Fondozzi has sincerely repented of his criminal ways: Interestingly enough, the Punisher finds that Mickey Fondozzi's change of heart frustrates his own mission. Fondozzi was one of the Punisher's principal informants (or "snitches"). But now that Fondozzi has "found religion" (as the Punisher puts it), the man is no longer useful to the vigilante. 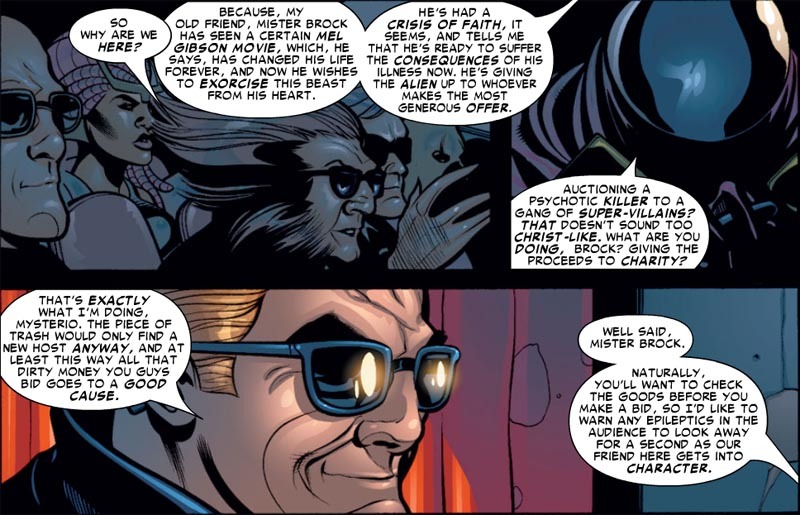 BELOW: Eddie Brock ("Venom") was moved by Mel Gibson's "Passion of the Christ" to renounce villainy, sell The Symbiote, and donate the money to charity: The Terrible Tinkerer conducts an auction for super-villains in which Eddie Brock is auctioning off the alien symbiote that transforms him into Venom - selling the symbiote to the highest bidder. 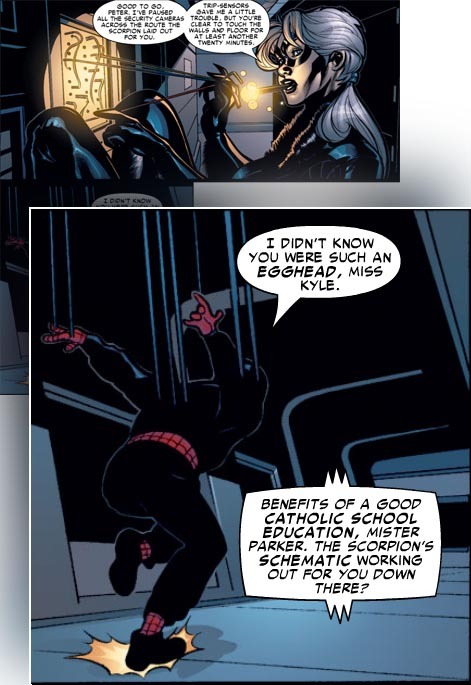 Note how Mysterio questions whether Eddie Brock's actions are truly "Christ-like." It is not every day you see a super-villain question whether somebody's actions are "Christ-like." But Eddie Brock's spiritual motivations in this case are very sincere, and hearken back to the earliest beginnings of this Catholic character, who first merged with The Symbiote after a sincere prayer in a Catholic church. Note how the Tinkerer refers to Eddie Brock's "crisis of faith." This term is usually used to describe as a period of doubt that causes one to question one's beliefs. In this case, Eddie Brock has come to doubt his life as a villain, and is actually turning back to his religious faith. It looked like a kid, maybe nineteen years old, Puerto Rican if the T-shirt of the Virgin Mary was anything to go by. BELOW: Rockslide invokes "Holy God! ": Young X-Men Rockslide, Wolf Cub and Dust attacked Magma (having been misled by Donald Pierce disguised as Cyclops). Magma super-heated Dust in her sand form, turning her to glass. Rockslide, a nominal Catholic, utters "Holy God!" in shock and perhaps as an unconscious prayer. 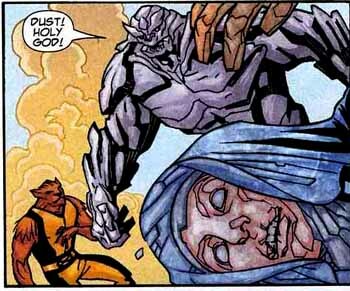 Coincidentally, the "glassified" Dust (who is a Muslim) appears in this panel remarkably like a statue of the Virgin Mary. This is probably unintentional.